God does not want me to place my focus on my needs, but on His faithfulness; not on world problems, but on His faithfulness; not on circumstances, but on His faithfulness; not on my feelings or opinions, but on His faithfulness; not on political change, but on His faithfulness. The truth of God’s faithfulness is something each of us will need to be reminded of many times throughout this year. 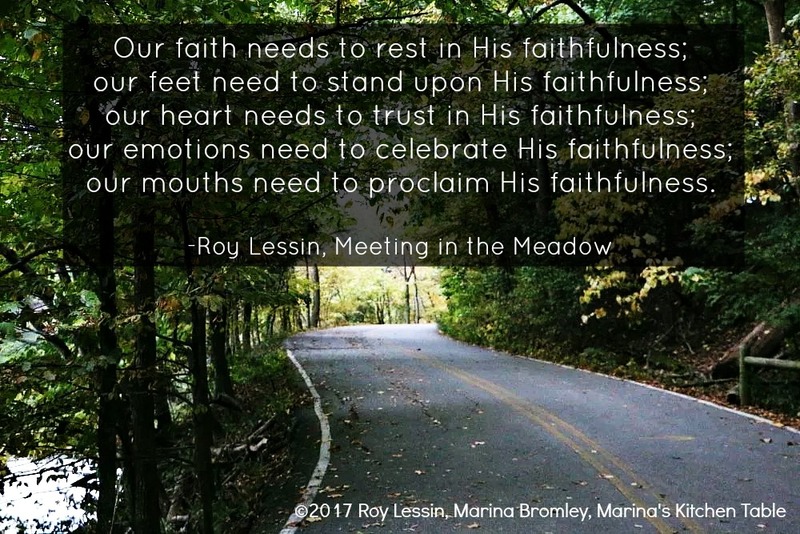 Our faith needs to rest in His faithfulness; our feet need to stand upon His faithfulness; our heart needs to trust in His faithfulness; our emotions need to celebrate His faithfulness; our mouths need to proclaim His faithfulness. God is faithful, God is faithful. All He’s promised to you. 1 Corinthians 1:9 AMPC God is faithful (reliable, trustworthy, and therefore ever true to His promise, and He can be depended on); by Him you were called into companionship and participation with His Son, Jesus Christ our Lord. Psalm 89:8 NLT O LORD God of Heaven’s Armies! Where is there anyone as mighty as you, O LORD? You are entirely faithful. ©2009, 2017 Roy Lessin. This post originally appeared online in 2009. Used with permission. Photo by Marina Bromley, Marina's Kitchen Table.